MERDAT2007 data decoder and stereo image display software. Look for new links to updated software. MER data decoder and stereo image display software. The possible variablity of the area of a triangle. My fourth astronaut conversation, this time with expedition 12 commander, astronaut Bill McArthur KC5ACR, onboard the ISS. 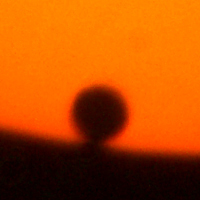 Venus transit 'Black drop effect' puzzle. This seems to me to be another example of Einstein's prediction that gravity will bend light. Scientists were happy that a star in the distance, eclipsed by the Sun, would appear before it should, due it's light being bent by the gravity of the Sun. 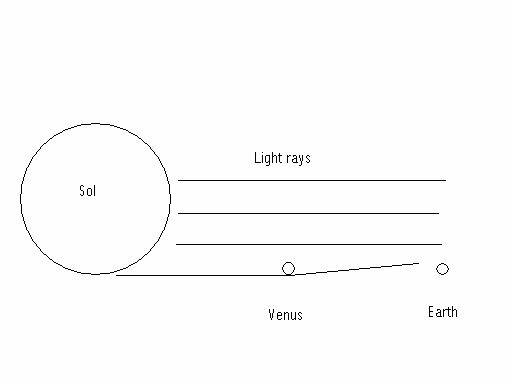 So, why shouldn't light from the limb of the Sun, be bent by the gravity of Venus, resulting in the black drop effect? The proof in my pudding would be if a small dimple of the Sun's limb reached out to Venus just prior to contact, during a transit. I cannot for the life of me, find any images, immediately before contact. Come on, Someone discuss this with me. It seems that this puzzle is not understod fully by science. After some further investigation, it seems that Mercury also exhibits the black drop effect as well, although, not as pronounced as Venus'. Unclassified Rissani market, Morocco, meteorites. onboard Space Shuttle Discovery + ISS Alpha. Renato, VK4TNT also made contact with Dr. Andy Thomas, I believe on the same pass. Another good long QSO, with several overs. Thanks Renato, well done. The SAS website is offline, but here is the old link=>www.sas.org.au/renato/ISS_qso_with_KD5CHF.mp3 MP3 1400kb I rescued the mp3 from archive.org. Q. Why do we amateur radio stations go to all the effort of setting up radio stations to talk to astronauts for a few minutes as they whiz past? 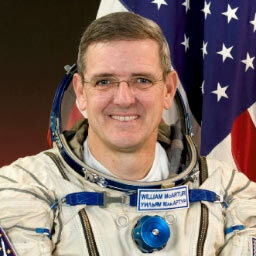 Some recent audio recordings of conversations with astronauts by Mauricio Beraldo, PY4MAB, in Brazil, South America. 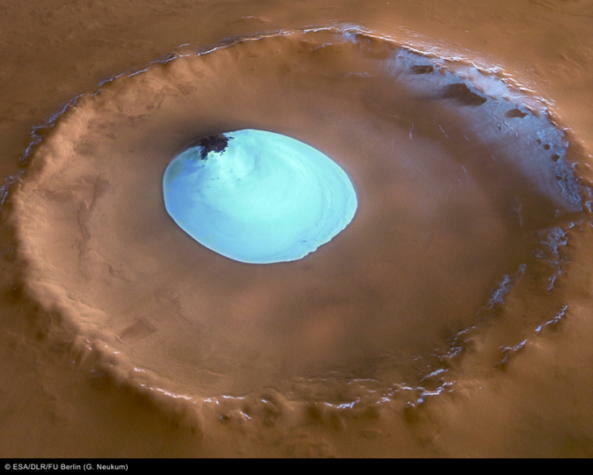 There is water on Mars! LOOK at it all. It might be frozen solid, like a glacier, but it's water. At last, it has been found. Water in sizable quantity on the Red Planet. Well done ESA. What a spacecraft. Click on the image to visit the European Space Agency website page. 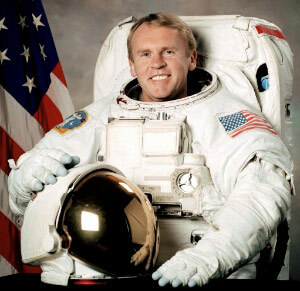 My second conversation with a spaceman. 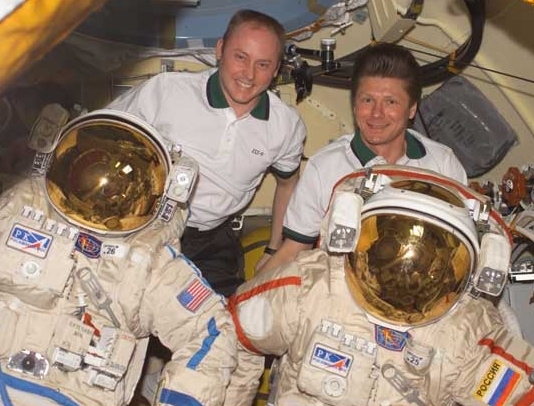 E. Mike Fincke and Gennady Padalka. Recording of QSO between astronaut E. Mike Fincke KE5AIT (using the callsign NA1SS) onboard The International Space Station Alpha, ISS, (Zarya) and VK3UKF on Earth, using an Alinco DJ-V5, 5 watt hand held transceiver and a power doubler. The antenna was a VHF 5/8 mobile whip, as used on an automobile. Recorded during ISS orbit 32529 +61 minutes, at 12.50 am, 1st August 2004, local Eastern Australian Standard Time, or 14.50 hours July 31 2004 U.T.C. Links to other ISS voice QSO recordings. Cor, PD0RKC has a new website in the making, but for now, find him at QRZ.com. Guy, ON6MU has an excellent page with several ISS voice conversations (QSO's). 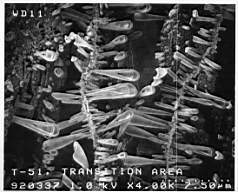 Hard to find image located, LDEF mystery 'Growth' image. Is this a 'Space Borne Fungus'? Click on the picture for the accompanying text and a larger JPG image. 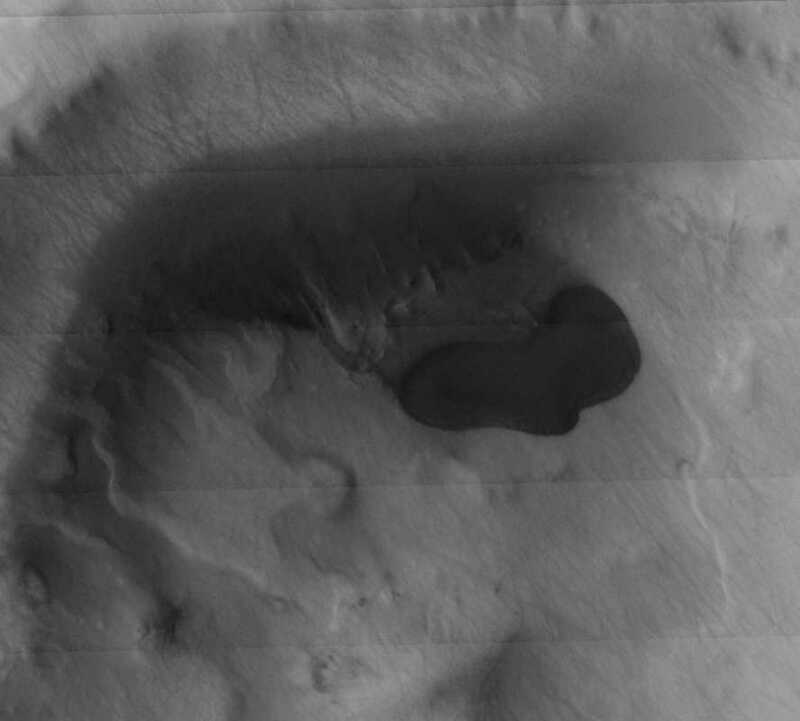 Wed. 28 April 2004 Liquid water found on Mars at last? Click the lake image to visit the original webpage. Something wonderful is about to happen. The ISS and ET Shadow. Want to help? If you are in Australia or nearby and wish to take part, please visit the TSNIIMASH website. and state your wish to participate. 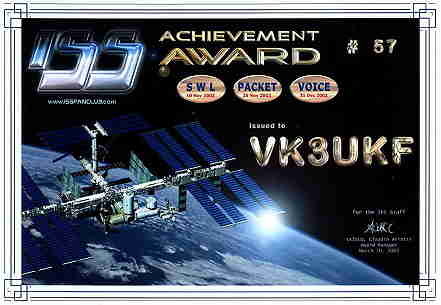 Radio contacts between VK3UKF and ISS, International Space Station Alpha. ARISS Phase 2, International Space Station Alpha, Packet System Papers as a PDF. Download the PDF help file for AGW packet engine. 1.5 MB approx. PCSAT (NO-44) Telemetry received at VK3UKF A Thank You, to Bob Bruninga and the folks at the U.S. Naval Academy for making it. Satellite Sounds. Some audio recordings of the noises they make. Here is a link to WX sat image archives by VK3UKF Fortunecity freeservers are sometimes down, come back later if no pictures are available. (Keps) Keplerian Elements for PC. These are needed by satellite tracking programs. http://www.alain.it/keps/ Link broken. Keplerian Elements for Palm Computers. These are needed by palm computer satellite tracking programs. APRS (Automatic Position Reporting System). Astro Photos by Kevin Forbes VK3UKF. Flight Lieutenant John William Newman, R.A.A.F. Second World War. John William Newman passed away in 2003, These images were supplied by one of his son's, Roger Newman of Castlemaine, Victoria. These haven't seen the light of day for years. 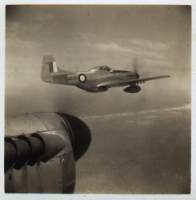 A collection of pictures by Flight Lieutenant John William Newman, R.A.A.F. First Service No. 431234. Second Service No. 033193. WW 2 and after math. 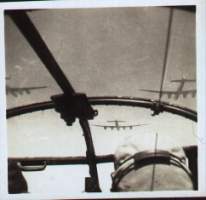 Featuring Australian Lancasters, Liberators, Gliders, Catalinas, Mustangs, and a Zero. 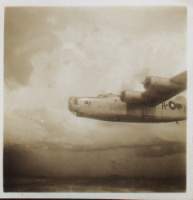 Flt Lt. Newman was in Hiroshima just after the atom bomb and took pictures. 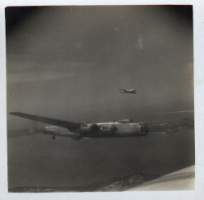 Pictures from the personal collection of R.A.A.F. Flt Lt. John William Newman. Click above for main image page No.1. 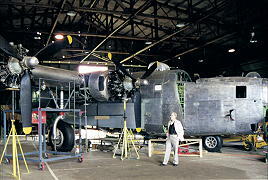 B 24 Liberator restoration project, Werribee, Australia. 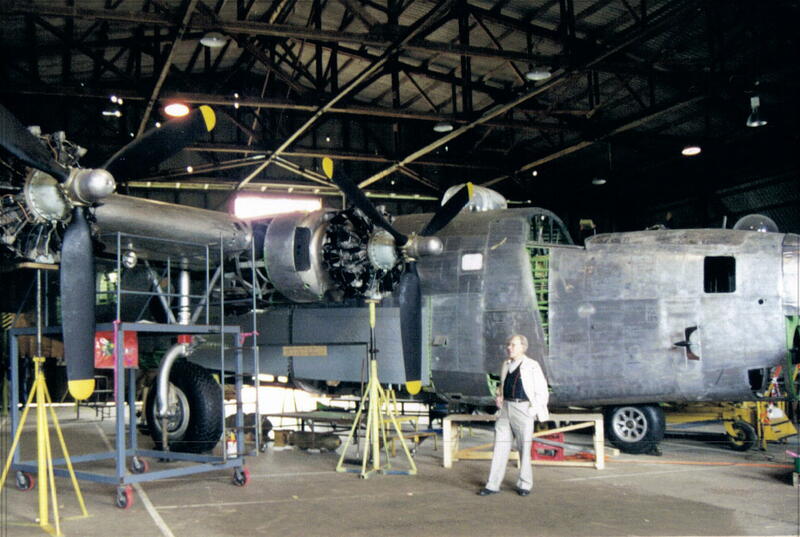 B24 Liberator restoration project, Werribee, Australia. Images of Space Postage Stamps from the following countries, Ajman, Australia, Bulgaria, Cuba, Dubai, Hungary, Mongolia, Panama, Poland, Romania, Rwanda, Russia(Soviet Union), U.S.A., Cameroon, Dominica, Thailand. Space Stamps. Postage Stamps celebrating space flight. C.B. radio related documents and links. C.B. radio 10 Codes PDF Document. C.B. radio 13 Codes, :-) PDF Document. 27 MHz C.B. radio Frequencies, U.S., Aust., N.Z., U.K., Marine. PDF Document. Modifications to the Philips FM320 UHF transciever. PDF Document. Philips FM320 UHF transciever repeater kit, components and circuit. Thanks to the chap that emailed these to me. I lost your email. Various Radio Codes and terminology. PDF Document. If your new to UHF CB. A book for you, maybe. UHF World. Everything about UHF radio, especially Aussie UHF CB. Please visit some of my friends and favourite sites below. A link to the Central Gold Fields Amateur Radio club. C.G.F.A.R. VK3JA, Maryborough. A link to the Midland Amateur Radio Club. M.A.R.C. VK3CMZ, Bendigo. The website is OFFLINE http://www.vk3app.com/">A link to the R.A.A.F. Williams Amateur Radio Club. VK3APP, Laverton. A link to the website of The Voice of the North, Peter VK8PDG, Palmerston, Northern Territory. http://www.vk8pdg.com/ link broken, got a new one anybody ?? A link to ON6MU (ex ON1DHT) space communications packet radio software and other great stuff. A link to ON6SAT. Everything about amateur radio and space communications. A link to AGW Packet Engine packet radio software and other great software by SV2AGW. Look for the AGWPE.zip download. A link to WXTOIMG software for making pictures from low earth orbit weather satellites using VHF radio and computer with a soundcard. An article at ARRL about 6 year old (now 7 yrs) (ex KD7TYN, ex KD7SDF, ex AD7BL), (I lost track), now AE7MC ?? Mattie Clauson. The Radio Shack Special. Try here also. The Radio Shack Special. Try here also. V good. An excellent amateur radio site in New Zealand by ZL3TMB, APRS and pager decoding programs (POCSAG) that operate using your soundcard.. The best Australian Scanner enthusiast page on the net. Another fantastic scanner page by Richard J. Wells. Heaps of software. Radio Programming Software. Trial versions, then $$$. This link broke, sorry. Xcorder. Sound Card Recorder software, only records when a signal is present. Saves on disk space. More info on the FM900 and the only page on the internet with the complete FM91 service manual and circuits. Supplied to me by John The Rabbit Man (deceased). Service manual scanned and posted by me before I got my call, when I was known as Capt. Nimrod. Ask someone that knows about FM900's and they will probably send you to this page. The link above broke many years ago, but the information still seems to be available on an archive.org snapshot of the website Click here for the FM91 manual. No-IP.com. Great internet services. Free servers. Free or pay for advanced functionality. Site re-direction, etc. Are you, or, do you know anyone interested in Numerology. This free numerology reduction program is yours for the taking. It is by Loren Michelle Hewitt. The website of Master Painter and Decorator, Mr Peter Antonio of Dunrite Painting and Decorating at Airport West in Melbourne Australia. The Earth IS hollow. According to my theories and understanding anyway. Wow did I get that all wrong, if you care to read my blether, do so at your own risk, but have a laugh, The explanation that actually sunk in for the first time is below my artwork. There is nothing I like better than having my misconceptions about the universe I find myself in, dispelled by truth, for truth is what I treasure most in this universe, for without it, we are little more than ignorant liars, which I admit to being on the odd occasion. I would like to thank Sterling Webb for setting me straight on this one. As one descends down into the Earth the measurement of G decreases. If you accept that gravity is a product of mass, (which seems to be the general consensus) if you were halfway between the very center of the Earth and it's surface, there would be 3/4 of the Earth below you and 1/4 of it above you, and, since gravity is the product of mass, G would be approximately 0.75 of its value at the surface. Actual measurements seem to confirm this. So, if one were able to exist under intense pressure and temperature and actually travel to the center of the Earth to make measurements, you would be surrounded by the mass of the Earth, pulling at you equally from all directions at the same time. Resulting measureable G would be 0 (zero). There is no magic gravitational pinhead source at the middle of the Earth holding the planet together. Most people seem to think this to be the case. What would one find? I believe stratification, at the very center, gases at high pressure and temperature, then liquid silicates overlying (or underlying from our surface dwelling perspective) molten metal. In effect, a reverse of the stratification layers we understand to exist from the surface down. Gases first (our atmosphere) then light silicates (the crust) then denser materials as you go down until you find molten metal. My theory calls for this stratification to reverse direction at a certain depth. In other words the Earth is more like a ball of onion rings. The lightest materials to be found at the surface and then the very core. I discussed this theory several years ago on packet radio. I got a few agreeing with me and a few asking me if there were holes at the poles where flying saucers could hide?? Really? 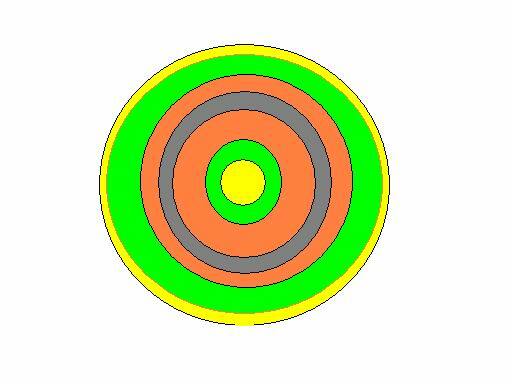 In the image I have made, yellow indicates gas, green indicates silicates or rock, brown indicates a mixture of rock and metal (pallasitic material), and grey indicates metal. The size of the rings is unknown, this image is only to demonstrate my theory. I also believe the gas bubble in the middle to be much smaller. Feel free to comment on this with me. A brilliant response by Sterling Webb. Some comments on the gravity piece. You've grabbed onto one piece of Newton's insight, namely that the gravity that one experiences inside a body of matter is only the gravity produced by the matter inside a sphere whose radius is the distance from your position to the geometric center of the whole body, so that the gravity of the Earth, as experienced anywhere inside it, decreases as you go toward the center, and reaches a theoretical zero at the very center. However, there is never any point at which the forces of gravity reverse themselves and from which a "settling gradient" from heavy to light would be found. To see why, you have to grasp Newton's original geometric argument. When you're on the surface of the Earth, every piece of matter in the Earth attracts you. The cubic mile right under your feet has the strongest pull because it's the closest. The cubic mile right at the center of the Earth has less pull because it's 4000 miles away. The cubic mile at the far side of the Earth has even less pull because it's 8000 miles away. But, when you average all the pulls of every cubic mile in the entire Earth together, not only is the average exactly what it is at the center, the force operates as if it were located at the center of the Earth --- when you average all the positional vectors (as we would call them today), that's the one position through which all the forces act. It's as if the entire mass were concentrated at that one single point! When you're one mile away from the center of the Earth, there is one and only one force being "felt" and that is the tug of eight cubic miles of Earth, acting from one mile away. It's still gravity and it's still pulling you down! Even at 1/1000th or 1/100th of a "gee," gravity sorts things by mass density. Very small planetesimals show evidence of having differentiated cores of iron with stone mantles. If a planetesimal cools before the iron can settle, you have plain chondrite. If it cools more slowly, you have flakes, bigger and bigger flakes the more slowly it cools, until a very slowly cooling body will allow all the iron to finally settle at the center. If there were any other force at work, it could easily overwhelm gravity. Every time we pick up a cardboard box full of junk, we are defeating the mass of the entire planet, tugging back. Gravity is 10,000,000,000,000, 000,000,000,000,000,000,000,000,000 times weaker than the electromagnetic force, for example. This periodic table of elements provides comprehensive data on the chemical elements including scores of properties, element names in many languages and most known nuclides. The Ringsurf was good when it was working, then it broke, then it died, it's just a place holder for ads now by the look of it. And now, well, it's just an example of an ancient programming language called HTML. My mug shot from years ago. Please visit another Kevin Forbes VK3UKF website. There is a link to my FORD VIN date decoding software on this page. It's free and it is for Non-US assembled vehicles. Australian, New Zealand, South African. Mexican Ford VIN date decoder version also available, it's in Spanish too. This page was repaired November 2013, links updated where available or links made to an archive.